As the owner of a private business that works in and around thousands of students within special education, I have a unique vantage point that has allowed me to pull back the curtain a bit on special education. Every role I've played has honed my laser focus on what's gone wrong, specifically, with special-education programs. And, I'm pleased to say, what's gone right. 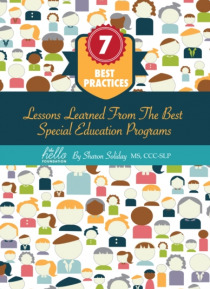 In observing the best, mo… st successful special-education programs, I have consistently identified seven practices. Because I care about every student in special education, I've decided to share these seven practices with the thousands of stakeholders who can make a difference. In this book, I describe each practice, give examples of how the best programs have addressed and surmounted barriers, and ask specific questions that interested programs should pose to their own teams. If we understand and replicate the cultural practices of the best special-education programs, I sincerely believe we have it within our power to create a revolution.